Since the Lollipop Update for Lenovo A6000 released, we have seen a number of our blog visitors complaining about the performance and the device lags. Now we are feeling to revert back to KitKat from Lollipop on Lenovo A6000 which was much better in terms of performance and had no lag issues. It is quite simple to revert back to KitKat just by installing a TWRP Recovery on Lenovo A6000 which is running on Lollipop and then flash the Stock Kitkat Rom for Lenovo A6000/Plus. Without wasting your time lets just go straight to the tutorial but before that please go through the warning message below. Disclaimer: Rooting or installing a custom ROM breaks the warranty of the device. You are sole responsible for this and we take no liability if your SD card doesn’t work or any other loss. 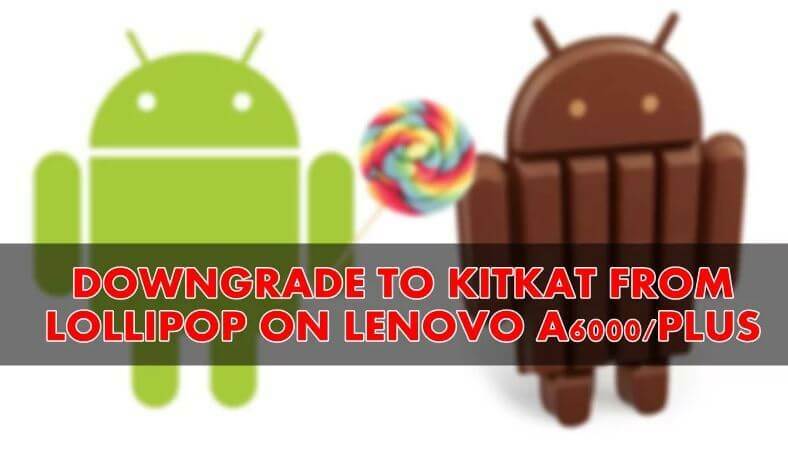 Stock Rom for Lenovo A6000 which will help you to revert back to KitKat from Lollipop on your device. Go back the main screen and select “Install” and then press one level up and select the SD Card. Extract the old stock ROM and then copy the META-INF and system folder from the newly downloaded file. Or just drag and drop to both the WinRAR files. Please wait until the system reboots to the screen where you’ll be asked to setuKitKatat. The boot time will generally take 2-5 minutes, do not assume that your device has been bricked, please have the patience and be calm until it boots up finally. Generally, the first boot takes a little time, but you’ll definitely revert back to KitKat from Lollipop on Lenovo A6000 and Plus. Ok so i have been in a place where:I can acces twr,i have deleted everything on the phone.I want to install the official rom in my lenovo a6000 from the twr menu.I have downloaded the zip file:Kraft-A6000-s_S017_151016_WCEC but when i try to install it it just gives me an error! So my question is:Is something that i do wrong? Please reply as soon as you can. How to revert back to kitkat from cm 12 ED300..please help me,explain step by step.sory my english. I Have lenovo a6000 and its was lollipop 5.02 but today i had installed 6.0 Marshmallow .. i want to reinstall my default os.. kitkat or Lollipop. Can anyone help me? Help!!! i did the method 1 just like it says! Now my mobile is stuck at the beggining screen doing nothing more!! I try to run bootloader again but it says “error: unauthorized. Please check the confirmation dialog on your device” BUT which dialog!?? Its stock!! Please help!! Rename the file to kitkat-recovery.img and put it to your Minimal ADB and Fastboot folder. When the phone is in the Lenovo screen, you are able to connect to adb. When the recovery is loaded on the phone, select wipe data/factory reset and confirm. Also wipe cache partition and confirm. Then reboot. After that, the phone started and was working fine. Thank you. Finally got away from that laggy Lollipop. The service center guys had said we cannot downgrade. which method you used ??? I have used method 1. while making system wipe go to advanced and check the boxes as required just format didnt work. This version has some bugs but dosent lag. you can use the above mentioned method just make complete wipe before flashing. Actually I realized something else too. We can’t simply copy the zip file ‘into’ internal storage. We need to copy it into a folder called ‘0’ which is the only folder ‘visible’ to twrp. Please don’t miss vital information. I risked doing the reboot, but now it is completely stuck at the Lenovo Logo. What seems to be the problem?? stucked at logo what to do now? please help quick..
hi i just updated my lenovo a6000 to lolipop nd facing lot of problem….as above stated i downloaded the stock file nd extracted it…..so nw witing to copy it to sd card …but have doubt after i transfer it sd card nd install it..vil it work properly…ndcome back to kit kat version ..plzz give suggestions……..
Hey, does this work on a6000+ ? Method 1 is success for me..But when i give system update to lenovo a6000 kraft-6000_S040_150805 (kitkat update)and when it goes to recovery mode, it couldnt install the update. I think there is some problem in recovery..Do i have to flash stock kitkat recovery.? If yes, then tell me how to do it? I was following method 2, as my stock recovery shows S052_150825. I replaced the contents of Kraft-A6000_S032_150327_WCDB.zip with the folders extracted from the zip file as explained. However, while trying to flash the device with A6000_S032_150327_WCDB.zip, flashing errors out saying cannot install from the Zip (No errors like trying to flash with a build older than the existing one etc), partition information updated it says. I ain’t sure where exactly the problem is, do you have additional workarounds? New update came for lolipop 138 mb !! Perhaps something went wrong. Let us know if you fixed it yet or not. I tried that. It was not booting at all. And recovery was lost too. I flashed CWM recovery and phone started but I am back to the same old S32_150327 build now. But baseband version is showing A6000_A_0001_150825. Is it normal? I think it is normal. But usually I see the same baseband version like the build. Yes but I have lost the recovery now. Cant able to boot into fastboot. if you followed method number 2 i could confirm that the stock recovery is trully missing..
Everything will revert to normal (Pure, no weird things), just like you bought a new phone.. and then you can update it to S040..
How to upgrade to S040? hey stucked at logo what to do now? I believe I replied you on the facebook group? i tried the second method on my 6000plus, its not booting to kitkat, after flashing stock kitkat twrp shows sucess, but when i reboot it gets stuck on boot logo, i tried cleaning cache, dalvik, data before & after install but still the problem is same. admin please suggest me some fix. Sounds strange to me, it works definitely. Delete dalvik/cache/partition and then reset once you flash the rom. Nop it doesn’t work. Still the SIM networks are not identified by the device. It’s updated now Shailesh. Thanks for informing us. i know lollipop have lots of bugs ! but in that site u should at least run the phone and not say it is bricked !! Did you make it work? Sorry for late reply. Cwm is available for lollipop or not??? how bro devendra, mine stuck on boot logo, tried in many way but so success. can u tell me how did u fixed it? i tried booting cwm in that time but no sucess, will try flashing now. did but no sucess. also tried the method 3 but result is same, can u tell me exactly what u did in step by step.?? will be helpful for me. Hello Devendra, I have flashed with a method 1. It says “Successful”, after reboot stuck at boot logo. How can I recover??? Any ideas? Error in flashing stock..cm 11 by above method.. I flashed 5.0.2 and as usual due to lag i had rooted the phone in expectation that after removal of security app etc it will speed up. There was no improvement observed so I reflashed CM11 and after that the phone got bricked and now doesnt detect anything and gives error like cant mount data and sd card etc and just lenovo logo is seen. Pls help and suggest a remedy…I am in a position to enter in the bootloader(volume down and power?) and thats how I amy be able to flash the recovery…however it doesnt go beyond that! also i hv read somewhere that the 12.1 is now bug free ( sim & camera fixed), can u confirm?? Link provided for Stock Rom is not working. If you have the CM11 then follow Method 3.
i have my cwm backup, how can i make a flashable zip?? my internet is limited so not able to download from ur site. please help me. 1. Extract the system.ext and then data.ext. 2. Copy META-INF from the stock rom if you have of Kitkat. 5. Zip the file and flash. i hv tried with winzip & 7zip but didn’t succeeded to extract, as the file in 2 parts, because the file is in 2 parts system.ext4.tar.a & system.ext4.tar.b .. any help? ?